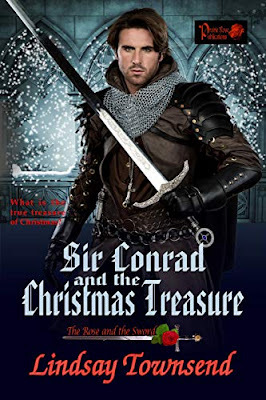 My sweet medieval historical romance, SIR CONRAD AND THE CHRISTMAS TREASURE, is up for pre-order. You can read it for free with Kindle Unlimited. What is the true treasure of Christmas? Maggie’s younger brother, Michael, is kidnapped by outlaws, and it’s up to her to rescue him. Appealing to Sir Conrad, the grim steward of the northern English high lands, is the very last thing she wants to do. With the very real possibility that the outlaws know of Michael’s talent—the ability to open any lock, to reveal any treasure—Maggie races against time to find him before his usefulness to the outlaws is ended. Sir Conrad desires Maggie from the minute he sees her—she makes him feel alive again—and that has not happened since the death of his wife. Though he hasn’t known Maggie before, a strange feeling of familiarity nags, and he agrees to aid the beautiful peasant girl in this quest of finding her brother. Joining forces, Maggie and Sir Conrad form a tenuous bond. When an assassin attacks Maggie, the pieces of the puzzle begin to fit, and Conrad realizes that even Maggie doesn’t know the power she holds. But Conrad not only must keep Maggie safe, he must thwart the dangerous devices of his spiteful older brother, Richard, who has lately returned from crusade. As love blossoms, Maggie and Conrad must protect one another. Evil is all around them, and doubt is a cruel enemy. Will their faith in each other keep them united? In the world of dangerous courtly intrigue, who is saving whom? Love is all that matters…but can that be enough? Here's an excerpt from my sweet Christmas romance, "Sir Conrad and the Christmas Treasure"
A gathering of horses, war-chargers, palfreys and spare mounts, a hasty bringing together of men, weapons and supplies, and they were off. They pounded out of the bailey, through the village and onto the track to the old Roman road. Sunrise to sunset they rode and then on through the night, sunset to sunrise. Riding in front of Conrad, his thick arms braced on her either side, Maggie felt her world shrink down to her heartbeat, the scalding ache of her thighs, the glare of snow and the relentless drum of the galloping horses. Had she ever imagined the recovery of Michael would be an adventure? Wishing she could clasp her aching head but not daring to relinquish her grip on the horse’s mane, Maggie longed to stop. “You awake there?” Conrad growled, his lips close to her ear. She shook her head as if he was a bothersome fly and forced her wind-chapped lips to reply. “Doing well,” she said, determined her teeth would not chatter. In truth she was not so frozen. Sir Conrad had supplied her with a thick cloak and a woollen cap, cloths to wrap round her boots and rags to bind her hair. If I could only have some eastern cushions for my hips, perched on this bony nag. Who knew horses had such a spine? Glancing sidelong she caught a knowing gleam in her companion’s deep eyes, as if he expected her to complain. But I shall not. “Yourself?” She tried a smile, the cold light of the coming dawn piercing her cheeks. “Naturally. The horses. And the pack mules,” she added, wondering why she was teasing him as she might have done Michael. The truth was, she had ridden with this man for hours, her back snug against his chest, her legs pressed against his long shanks. It was hard not to feel a kind of closeness to him. Now, she felt rather than heard Conrad’s rumble of a chuckle and knew a fleeting lightness in her soul as his arms tightened briefly about her. “You will not be outdone, will you?” He guided their mount onto an unpaved section of road that did not jolt her bones, which was overall a blessed relief. “Is this a contest?” she replied, catching her wind-sore mouth in a yawn before she could stop it. He smiled against her woollen cap and Maggie closed her eyes. The great horse moved beneath her, smooth now as a sailing ship on a calm river, the beat of its hooves strangely soothing, like a lullaby. I wonder how Michael is faring, she thought as she slid slowly, inexorably into sleep. Conrad gently lowered the sleeping girl onto the rough pallet of bracken and hay that he had set before the new fire. She had done well, he decided, nodding to Davie, a silent reminder that the man guard her, before he checked on the horses and men. A palfrey had picked up a gorse or bramble tear on her flank. Conrad was conferring with a groomsman how to treat the wound when the weary peace of the camp shattered. Lurching out of the darkness, Maggie staggered back to the fire, plucked out a burning branch and brandished it at the figure coming after her. “What is happening here?” Conrad pushed between the pair, scenting the mead on the farrier’s breath. “A bit of sport.” Brian swayed on his feet, squinting past the taller man as he gave the girl a wave. Has this fool been drinking all night? Supping while on horseback? Conrad sensed the camp about them stiffen and knew his men were leaning in to listen. “Ladies do not bawl like market criers,” he drawled. He caught the girl’s arm and led her, none too gently, back to the pallet by the fire. “You stay,” he ordered, ignoring her look of utter betrayal. He turned to leave, go back to the horses, when a narrow wiry hand grabbed his cloak. Looking back, he almost flinched at the flinty glare which stabbed him. With the I was wrong hanging between them, she stepped aside and flounced down on the pallet with such force that a puff of hay-dust rose in the air between them. Sensing he had made a mistake, loathing that feeling, Conrad stamped back to the horse lines. Later, too brief a time to be truly rested, they rode on, into the forest of Galtres. The girl sat before him, silent as a stone. I thought you were different. “What happened to you?” he growled, too low for her to hear. He disliked her being so stiff, that was all. I do need my farrier. She had no right to complain. As for Brian approaching her, it is the way of the world. In a war-band, everyone expects it. So why did these reasonable justifications seem hollow?